I had not seen New Order during more than 12 years and now I was about to see them a second time in 24 hours! I hoped that the set list would be different from the previous day - being aware that Joy Division and New Order used to change the songs they played every night - but was not so sure as I knew that recently they seemed to have changed tactics - but had decided anyway that I would be in the front rows this time. 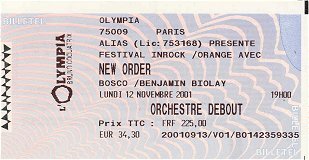 The concert was to be broadcasted live on the french radio by courtesy of Bernard Lenoir, the very same Lenoir who had broadcasted Joy Division in 79 from Les bains Douches! They opened with "Crystal" - after the announcement of the band's arrival by Alan Wise (like the previous day) - followed by "Transmission", quite brilliant, "Regret", which was very good - though not one of my favourites, and "Ceremony", as magnificent as ever. They kept on playing the same songs as the day before, "60 Miles An Hour", "Your Silent Face" and "Atmosphere", Bernard introducing Steve, Peter and Phil. This song had given the "young boys" the opportunity to prove one more time all their talent and class. 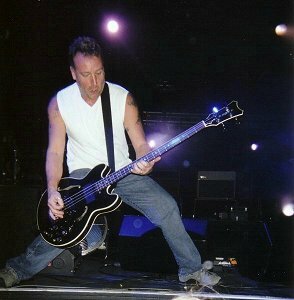 Then we could enjoy "Close Range", "Touched By The Hand Of God", "Bizarre Love Triangle" with a splendid bass, "True Faith" and again a great version of "Temptation" with an omnipresent Hooky. They left after playing "Love Will Tear Us Apart". They were back very quickly, Hooky stating that "It has been so long ... since yesterday", to play "Rock The Shack", "Ruined In A Day" - Steve showing all his drummer qualities, and ending with "Blue Monday". In the final section, Peter was kicking his little drum kit like a madman, with his naked fists in place of sticks. 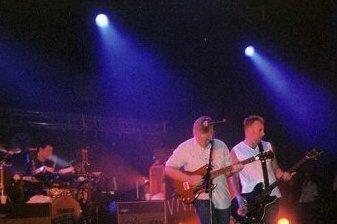 So the set list and length show had been identical to the first gig, but the atmosphere rather different, as the sound was not as clear and good as it had been on Sunday, and I was much closer to the stage, on the right side, with a good view-point on Hooky, Steve and Bernard. I probably should have felt tired after all the ferocious dancing, but it was quite the opposite. New Order are definitely a magic band! And thanks to my parents, to Erik and to Bernard L, I have a nice souvenir of this gig!